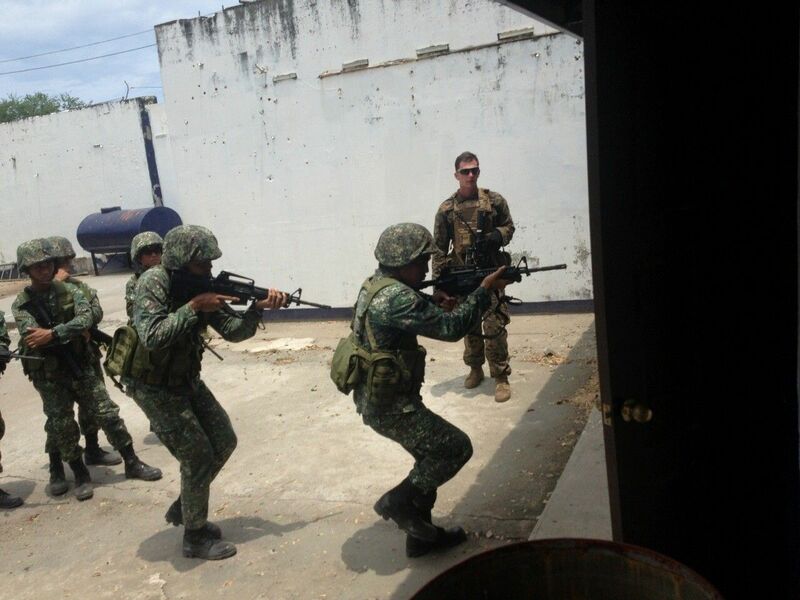 In this June 30, 2017 photo, during the 2017 maritime training activitity, U.S. Marines from 3rd Battalion, 8th Marines, 3d Marine Division helped Philippine Marines to improve their basic urban warfare techniques based on feedback from Philippine military forces in Marawi. MANILA, Philippines — The Philippine and US navies launched its annual maritime training activity at the Naval Station Ernesto Ogbinar in San Fernando City, La Union. The week-long engagement between the allies includes activities on a wide range of naval capabilities, which will take place in La Union, San Antonio and Subic in Zambales and Manila. The US Navy's fast transport ship USNS Millinocket, diving and salvage ship USNS Salvor and a P-8 Poseidon maritime surveillance aircraft will be deployed along with the Philippine Navy's BRP Ramon Alcaraz and BRP Tarlac in the South China Sea for at-sea evolutions. The navies will participate in air defense exercises to boost proficiency in air and missile defense, diving exercise to promote mutual efficiency underwater and search and rescue exercises, the US Navy said in a statement. Symposiums and seminars on medial, public affairs, engineering, explosive ordnance and disposal and anti-submarine and surface operations will also be held in other naval bases. The Japanese Maritime Self-Defense Force will also join the exercises as an observer. Rear Adm. Joey Tynch, commander of Task Force 73, said the name of the naval drill "Sama-sama" perfectly captures the relationship of the Philippines and the US, which have been allies for 70 years. "Built on 70 years of strong friendship and deep historical ties, our shared interest in maritime security is what Maritime Training Activity Sama Sama is all about — our shared belief that regional challenges increasingly require cooperative solutions by capable naval forces," Tynch said. Lt. Gen. Emmanuel Salamat, commander of the Northern Luzon Command, said the training provides an opportunity for both navies to engage in a broader range of maritime operations and unique scenarios. "In this way, we could explore for more cooperation, enhance our interoperability, and provide us effective mechanisms for collaboration and partnership of our Navies in the spirit of our mutual treaty engagement," Salamat said. This year's maritime training activity would focus on developing mutual capabilities in addressing maritime security priorities and concern for mutual interests.